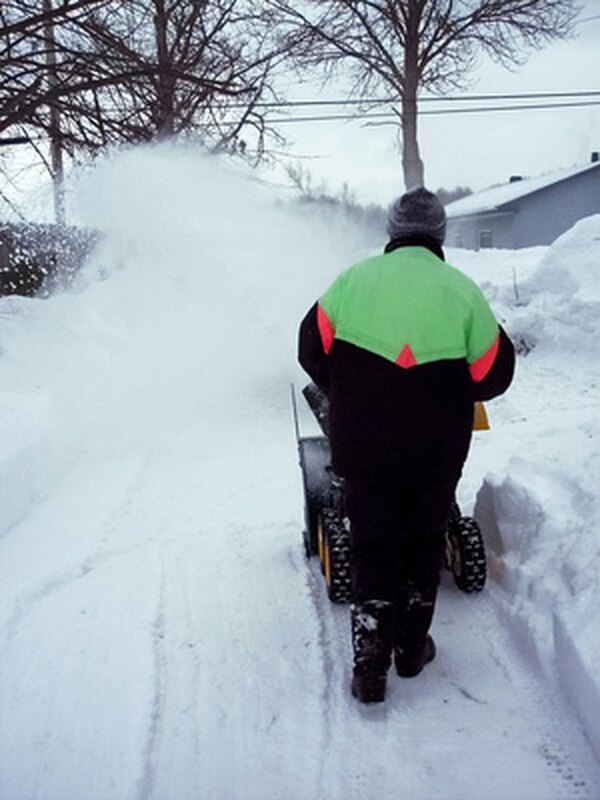 Most gasoline-powered snowblowers use either Briggs & Stratton or Tecumseh engines to power the snowblower. These engines utilize a recoil pulley with a pull rope for starting the engine. Over time, exposure to weather and normal wear and tear can cause the rope to deteriorate and break. Replacing the starter rope takes just a few minutes with some basic hand tools. Removing snow with a snowblower. Disconnect the spark plug wire from the spark plug by pulling on the rubber boot that covers the spark plug. Loosen the three bolts that hold the starter shroud onto the engine. Lift the starter shroud off of the engine, and place it upside down on a work table. Hold the starter shroud with one hand and turn the pulley inside the starter shroud counterclockwise until it won't turn any further. Clamp the pulley in place with the wide-jaw locking pliers. Pull on the knot in the knot hole near the middle of the pulley with a pair of needle nose pliers to remove the section of broken rope. Insert the end of the new rope (with the handle on the other end) into the hole in the starter shroud, and guide it toward the knot hole in the center of the pulley. Grab the rope in the knot hole with the needle nose pliers, and pull out about a foot of rope. Tie a knot in the end of the rope. Singe the remaining end of the rope with a match or lighter to prevent it from unraveling. Pull on the rope from outside the starter shroud to seat the knot in the knot hole. Release the wide-jaw pliers, and allow the pulley to recoil, winding the starter cord around the pulley. Position the starter shroud onto the engine, and tighten the bolts to lock the shroud in place. Re-attach the spark plug wire to the spark plug.